St. Louis Alderman Scott Ogilvie has raised questions about providing public subsidies for high-end development, such as Ballpark Village. Before voting against an incentive package for expanding Ballpark Village, St. Louis Alderman Scott Ogilvie delivered one of the more unusual opposition speeches in recent memory. 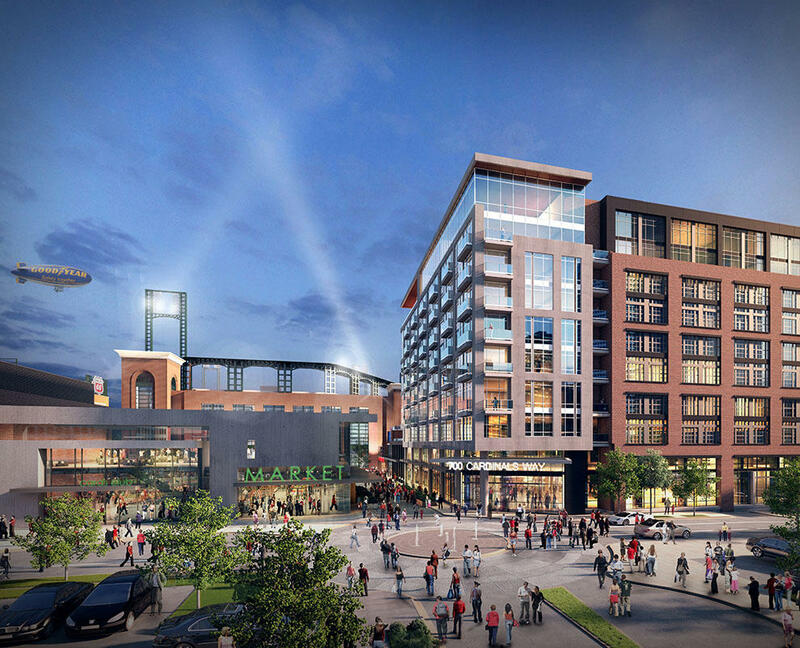 Ogilvie’s address wasn’t enough to stop the Ballpark Village plan from initial passage. But in some ways, his words were an opening salvo of sorts to an impending debate over publicly funding a professional soccer stadium. Although the SC STL proposal and the Ballpark Village requests are unrelated, they both fall into a similar category: Providing public support to facilitate sports-related development. Publicly funding sports facilities is a touchy subject for aldermen, especially after a year-long legislative fight over a scuttled riverfront football stadium stoked passionate debate and raw feelings. This stadium episode also arrives a few months before an unpredictable municipal election cycle, one where members of the Board of Aldermen are either running for mayor or re-election. If that weren't enough, the looming soccer stadium debate comes when some aldermen are looking at development incentives more critically. That includes Alderman Christine Ingrassia, who represents the ward where the proposed soccer stadium is located. According to documents sent to the Missouri Development Finance Board, more than 30 percent of the project’s total cost will feature some sort of state or local support. Take out the estimated $200 million expansion fee that’ll be paid for with private sources, and that public subsidy goes up to 60 percent. “There’s a certain level or percentage of tax incentives that I’m just not comfortable with. And when it crawls up to 30 or 40 or 50 percent or higher, I’m never going to be in favor of something like that,” Ingrassia said. She added that she’ll check to see whether a substantial community development agreement is attached to the project. While any ballot measure related to stadium financing is bound to provoke debate, some key differences exist between the Rams saga and the MLS chase. 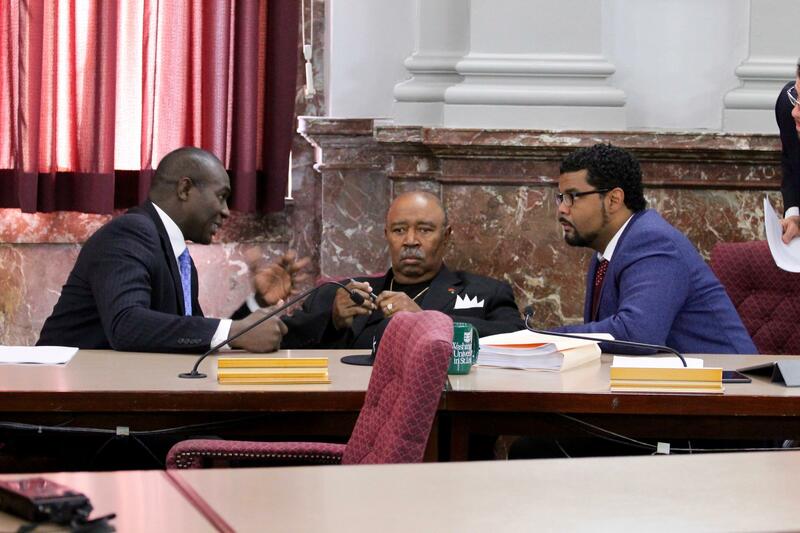 St. Louis Board of Aldermen President Lewis Reed, left, talks with Aldermen Sam Moore, center, and Antonio French last year about a riverfront stadium funding deal. For one thing, backers of the soccer proposal have vowed to take any proposal to the voters, which wasn’t the case during the riverfront stadium saga. And frankly, backers of the project may not have a choice. If the city-based public financing requires raising some sort of tax, the Missouri Constitution almost always requires a public vote. “Some of the negative feeling was that it had not gone to a public vote and we intend to take this issue to a public vote, said Otis Williams, director of the St. Louis Development Corp., last week after a Missouri Development Finance Board meeting. The proposed St. Louis soccer stadium would be west of Union Station. Unlike the Rams, who were hell-bent on taking their substandard product to the Los Angeles area, there appears to be real momentum Major League Soccer expanding to St. Louis. After all, the SC STL proposal featured positive sentiments from MLS Commissioner Don Garber. And the ownership group features people experienced in owning sports franchises, namely Paul Edgerley (Celtics). Whether these variables are enough to cool opposition in the Board of Aldermen remains to be seen. But one thing’s for sure: If stadium backers want to get a funding proposal on the April 2017 ballot, they’ll need to act quickly. The deadline to get something on that ballot is Jan. 24. St. Louis Public Radio's Rachel Lippmann and Marshall Griffin contributed information for this story. MLS in St. Louis? What’s the history of soccer here? 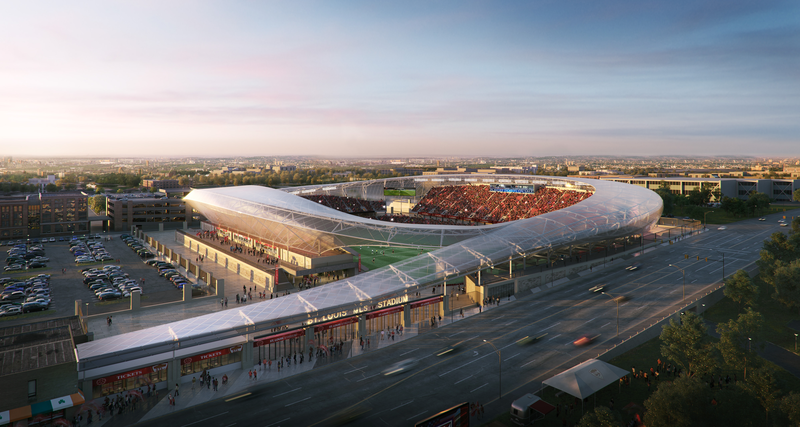 Major League Soccer has begun searching for a stadium site in St. Louis. With that news, “St. Louis on the Air” decided to look back at the history of the sport in St. Louis. One of two groups that want to bring major league soccer to St. Louis will hold a public forum Tuesday night. Foundry St. Louis is a group of mostly St. Louis residents attempting to secure an MLS Soccer franchise and stadium. The group is offering people the chance to give their input on initial plans for a stadium that could possibly be built near the Saint Louis University campus in the city of St. Louis. Foundry St. Louis President Nicholas Mahrt says St. Louis deserves an MLS team because of the area’s history with the sport. A decision on an offer to cover a funding gap for a proposed soccer stadium in St. Louis could rest with the top professional league in the U.S.
Two groups have been trying to secure a local MLS expansion franchise and one is suggesting a partnership that could eliminate the need for public money. Foundry St. Louis officials say they are willing to put $80 million into the $200 million project proposed by SC STL. St. Louis Mayor Francis Slay says it isn't up to the city to approve such a plan.